Sauerkraut is fermented white cabbage as opposed to pickled and shouldn’t contain vinegar. It’s the lacto-fermentation which makes sauerkraut such a healthy vegetable. Sauerkraut is high in digestive enzymes, fat free, cholesterol free and high in vitamin C. It is also quite high in sodium, so should only be eaten in moderation by people with high blood pressure. You can reduce the sodium by rinsing the sauerkraut before cooking. Cook the potatoes and save 150ml of the cooking water. Mash the potatoes with half of the single cream. Heat the oil and fry the onions until soft. Add the tomato puree and tofu and stir fry for about 2-3 minutes. Add the cooking water. Mix the sauerkraut with the other half of the single cream and put on the bottom of an oven proof dish. 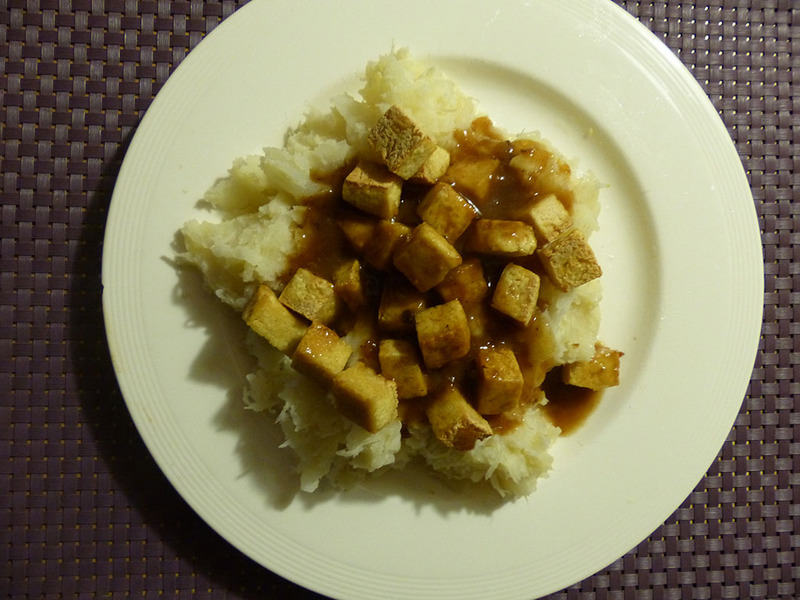 Pour the tofu/tomato sauce on top and top up with the mashed potatoes. Sprinkle the (gluten free) bread crumbs over the top and bake in the oven at 200C (gas mark 6) for around 35 minutes or until it’s heated through.